In 1916 in Everett, Washington, a passenger ferry loaded with Industrial Workers of the World (IWW) free speech activists attempted to dock. On the dock, the local sheriff, along with armed deputies and armed guards hired by local businesses, attempted to block the ship from docking. According to lore, when the sheriff asked, “Who are your leaders?” the response from the ferry was a shout from everyone aboard, declaring, “We are all leaders here.” As folk musician Utah Phillips explains, “that scared the tar out of the ol’ law you know”1 and as a result, a gunfight ensued. The gunfight left at least five IWW members dead and became known as the “Everett Massacre.” In the documentary film The Wobblies (Bird and Shaffer 1979), which tells the story of the early years of the IWW, two IWW members recount their experience in the “Everett Massacre.” Years later, Utah Phillips recounted this story on a collaboration album with popular musician Ani DiFranco, spreading the story and message to a new generation. In September of 2007, over ninety years later, in North Providence, Rhode Island, a labor rights march turned into an altercation with police. Several marchers were pepper sprayed and one marcher’s leg was broken when she was tackled by police. The march was organized by the Providence IWW. The group had planned to march to a local restaurant and picket it in order to pressure the restaurant to stop purchasing from a food supplier in New York City, which had been the target of an IWW campaign for abusive employment practices.2 After the violent confrontation with police, the union announced that they were making a call toWobblies in the northeastern U.S. to come to North Providence to protest the actions of the North Providence Police Department. Several days later, the IWW website carried the headline “IWW continues organizing and free speech fight in Providence” (http://www.iww.org/en/node/3593; Industrial Workers of the World Website 2007). This headline illustrates attempts by the contemporary IWW to make connections to the past struggles of the union. By announcing the protest as a free speech fight, the union was inserting this new fight into a longer narrative of struggle both with industry and the state that had become well known throughout the union. Although there has been much written about the IWW, most of it has focused on the history of the IWW as an organization or on leaders within the organization.4 Rather than focus on the organization’s infrastructure, this article explores the union’s culture and ideology as expressed through narrative, much of which is rooted in anarchistic ideals and philosophy. Narrative accounts of IWW activism, as well as narrative expressed through music, film, and poetry have helped sustain the IWW as a labor union by constructing and reproducing the organizational identity. The culture carried through song and art has also served as a mediator for the ideology of the IWW, and although the IWW has never been explicitly anarchist, the extensive presence of anarchistic ideals in the narrative indicates a relationship beyond even the level of affinity. Specifically, the questions being dealt with are: How has the theme of anarchism been negotiated within the IWW and how does it appear in the narrative? In addition, how has anarchism functioned within the organizational narrative? In addition to the contributions this article makes regarding the IWW’s continued survival as an organization through narrative, this examination also contributes to an understanding of anarchism as a narrative component, and provides an illustration of the ways that anarchism, and the idea of anarchism, functions within a labor union that has not explicitly defined itself as anarchist. Many scholars have noted the importance of changing political and economic situations to create openings or opportunities for social movements to mobilize.6 The resurgent IWW has benefited from and taken advantage of many changing structural opportunities. A clear example of this has been in the SWU campaign. The campaign is a project of Industrial Union 660, the retail workers union. This campaign, initiated in 2004 in New York City, has spread to cities throughout North America. 1. Utah Phillips and Ani DiFranco, 1999 Fellow Workers [Audio CD]. Righteous Babe records: Buffalo, NY. 2. For more information about the Providence incident, see Industrial Worker, September 2007, and The Providence Journal online, http://www.projo.com/ri/northprovidence/content/GALAXIE14_08-14-07_ BH6NSPP.34ba2ed.html (Salit 2007). 3. See, for example, Daniel Gross, “Latte Laborers Take On a Latte-Liberal Business,” New York Times (March 30, 2007), http://www.nytimes.com/2007/04/08/weekinreview/08gross.html. 4. See, for example, FredW. Thompson and Jon Bekken, The IndustrialWorkers of theWorld: Its First 100 Years (Cincinnati, OH: Industrial Workers of the World, 2006) and Salvatore Salerno, Red November/Black November: Culture and Community in the Industrial Workers of the World (Albany: State University of New York Press, 1989). 5. 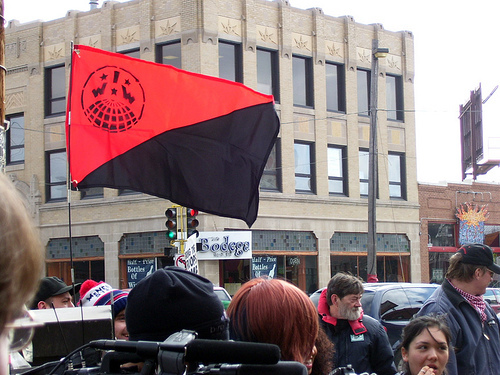 More recent works on the IWW by Franklin Rosemont (2003) and Rosemont and Radcliffe (2005) have placed their emphasis on the culture surrounding the IWW. Rosemont (2003) examines the life and influence of famous “Wobbly,” as IWW members are called, Joe Hill. He argues that the life and work of Joe Hill and the IWW have spread their influence far beyond IWW union halls through widespread cultural transmission that has then spawned many revolutionary and working-class movements. Further, Rosemont and Radcliffe (2005) examine the influence of the IWW on various radical movements of the 1960s and 1970s, including anarchism. 6. See, for example, Gamson and Meyer, “Framing Political Opportunity” (Cambridge: Cambridge University Press, 1996) and Sidney Tarrow, Power inMovement: Social Movements and Contentious Politics (New York: Cambridge University Press, 1998). Although at times the IWW has embraced anarchism, it is clear that more often, terms such as “direct action” and symbols such as the black cat are used to negotiate the theme of anarchism. Similarly, when members talk about anarchism and the IWW, it is often indirectly. - It wasn't! It was formed by an array of labour organisations some of which were quite large such as the Western Miners Federation, Brewery Workers Union, etc. Also the author's discussion of the "anarchist movement" in the US seems also quite poor. He fails completely to look at its social composition. In the early days of the IWW and the lead up to its formation it was very much a network of militant workers. In the years since the IWW's re-emergence since the 1960's,consists mainly of more of students, middle class elements and workers with high levels of autonomy in their jobs. Salvatore Salerno's Black November/ Red November throws important light on these facts. This "fact" has recently changed in the British Isles section of the IWW. About 1 year ago the there began a serious drive to attract workers outside of the anarchist/libertarian communist mileu. Despite the predictions of a fast drift towards "a-political" reformism IMO, (mostly by anarcho-synicalist types), it has resulted in the increased militancy of the organisation and a significant orientation towards struggle at the central point of class conflict and exploitation: the workplace rather than "anarcho activist" inspired demos and the endless (pointless) social gatherings and meetings that largely constituted that mileu (until last years student demos). The complaints of many of the local "activists/anarchists" concerning the IWW are about such benign things as Roberts Rules of Order vs. Consensus decision making. In many branches, including mine (IUB 560) there is virtually no influence from these 'activists' and we are becoming one of the best organized/militant/successful branches in the union. I know of other Branches such as the Nebraska GMB that are having similar successes due to their commitment to building a union rather than a "social/lifestyle/activist club". These changes ,and the shift away from 'activist' politics, will grow the IWW into the best union it can be for all workers. And I'm an anarchist. But I don't want the IWW to be an 'anarchist' organization de facto or de jure. Perhaps not much of a solid comment I suppose. And broadly said and applicable to all our shopwork. The few mentors who I had implied that the building a revolutionary labor movement isn't so much about "labels" or "brands", it's really about content. And during my shpfloor years, this was always my approach. cho-syndicalism or, in the case of the IWW direct solidarity unionism, got to help to nuture, develop and build the libertaian/anarchist content in a way that is solid. Some workers are born "anarchists", others not. "We" just need to be doing our best to help co-workers enhance and aquire the tools and visions along the way. And do it in a way that's not too preachy. I agree broadly that the IWW should separate itself from the anarcho/radical left subcultures that exist out there, if they are obstacles. But the IWW was, is and will always be a radical left organization, so I think we should be carefully making the difference between distancing ourselves from behaviors and cultures and distancing ourselves from radical politics. Also, not every place is Madison. That place has a particular kind of anarcho/radical left thing that is more a throwback to the 90s than anything that is really dominant anywhere else. For example, probably one of the spots for that scene in the TC is the free space, in which half the collective is in the IWW, most of them being some of the more active workplace organizers in retail and food. it is clear that more often, terms such as “direct action” and symbols such as the black cat are used to negotiate the theme of anarchism.